Wayne and I have been in the States for three weeks taking care of some business. It is the longest time we have been away from our cabin in the last six months and we are anxious to get home. Today is the long awaited travel day from Bellingham to Powell river via two BC Ferries up the Sunshine Coast. The easiest route north from Bellingham is the Guide-Meridian to the Lynden/Aldergrove border crossing. The Guide (as it is lovingly called) is a two lane road that is currently under construction, but it is still a good route except during rush hour. Because the border crossing is away from the I-5 corridor, it is usually less crowded and cars move through quickly in both directions. At the border The Guide changes into 264th Street and continues straight north to Canada Highway 1. 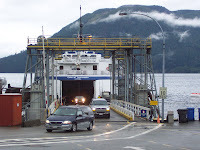 Highway 1 will take you northwest around downtown Vancouver and directly to the Horseshoe Bay BC Ferry Terminal. As you near the terminal, you will experience more road construction in preparation for the upcoming 2010 Winter Olympics. 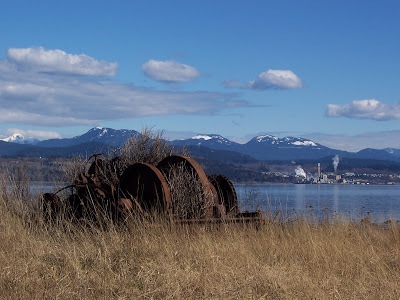 There are some really great views in and around where I live in Powell River, BC. Some of the most spectacular can be reached by hiking or riding a quad to lofty peaks and bluffs. Head up to Blue Ridge for a panoramic view of lakes, forests and mountains. Summer or winter, the bluffs on Mount Mahony provide views of Powell Lake, the Strait of Georgia and across to Vancouver Island. 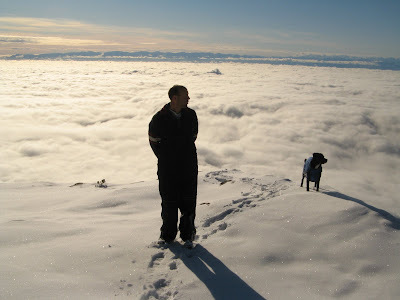 On this November day it looked like you could step off and walk on the tops of the clouds. 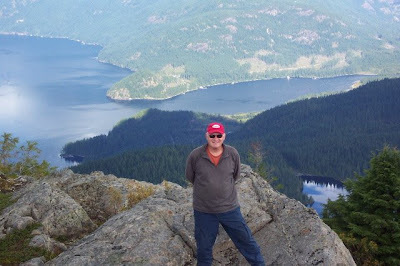 A quad ride then a hike to the top of Tin Hat Mountain rewards you with an outstanding view of Powell Lake far below. Throughout the bush in Coastal BC you will find old logging roads. Many are overgrown, but some have been reactivated by hiking and ATV clubs, and other outdoor enthusiasts. 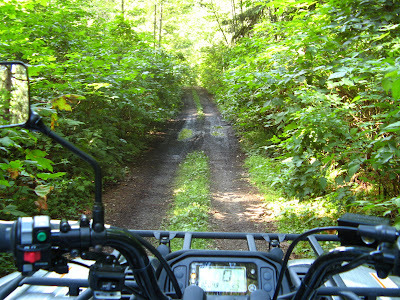 Here are a few "roads" we like to travel on our ATVs. Do you ride a motorcycle or quad? Are your roads and trails limited? 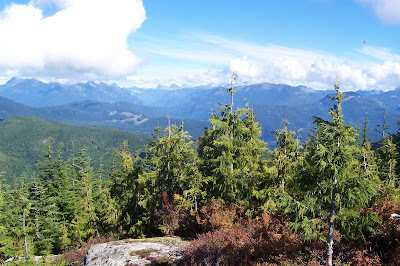 Come to Powell River and discover our spectacular back country. 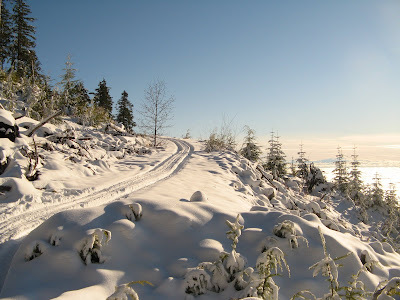 We have hundreds of miles of forest service and logging roads that are open to the public on weekends and holidays. Bring you bike and stay in one of our lakeside campgrounds and use it as a home base. Because the roads almost all interconnect, you can ride for days without seeing the same territory twice. Fall is the best riding season, so come see for yourself. What better way to cool off on a hot day than with homemade ice cream. When we are at our float cabin, ice can be hard to come by. We have a propane refrigerator, but the small freezer is usually full. Towards the end of the week there's finally enough space to make a bag of ice. I researched to find a small manual ice cream maker. What I purchased was the Play and Freeze Ice Cream Maker by Industrial Revolution (www.icecreamrevolution.com). I got mine at REI. You can get it online or at a store near you. I have the pint size. There's also a quart version. Ice cube trays filled half way work best. After I have a one quart plastic bag filled I'm ready to go. Directions for making ice cream are simple. 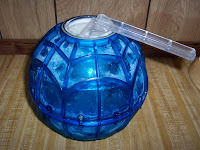 Fill the ball with as much ice as it will hold. 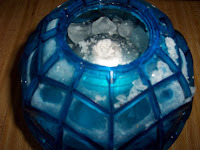 Add 1/2 cup rock salt to the ice to increase its freezing power. Cream makes a smoother ice cream. When I am at the cabin, I use a can of Carnation Thick Cream (but it's getting hard to find) mixed with enough canned milk to make the one pint of liquid. 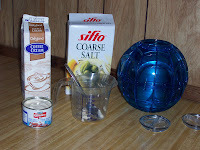 Mix your ice cream ingredients and place them in the other end of the ball. Now shake or roll the ball to make ice cream. I've found it takes longer than advertised. I open the container at 10 minutes and scrape the sides with a plastic spoon. Otherwise, it freezes hard on the outside and remains liquid in the middle. I check it every 5 minutes and repeat as necessary. I also add more ice if room permits. I pre-chill an aluminum bowl. 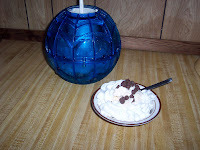 When the ice cream is of soft serve consistency, I transfer it to the aluminim bowl and put it in the freezer to harden. At this point I might add chocolate chips, coconut or frozen berries to make a custom flavor. The possibilities are endless. I've even put it in a graham cracker crust to make an ice cream pie. The possibilities are limitless. During September, my garden is still producing. I hate to lose the veggies that are just coming in, namely my peppers and tomatoes, so we've been eating them in lots of ways. Here's a simple salad recipe that brings out the flavours of fresh veggies. Toss and refrigerate to let the flavours to marry. Serve and watch everyone enjoy a fresh, healthy, tasty treat. 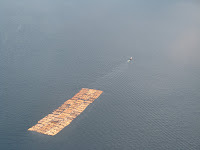 Last week you read about the Strait of Georgia. 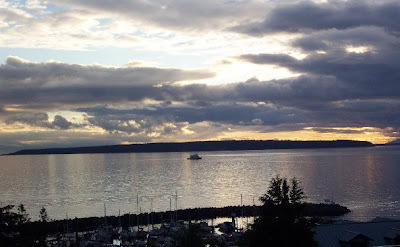 It is an integral part of our life in Powell River and creates the spectacular view from my condo window. In the strait you find many islands. Probably the most famous are the Gulf Islands near the tip of Vancouver Island, but directly in front of Powell River is Harwood Island. Like many other locations in the Strait of Georgia, Harwood Island was named by George Vancouver during his exploration of the Puget Sound and Coastal BC in 1792. In this case, Harwood Island was named for Dr. Edward Harwood, a scholar and naval surgeon. Geologically, Harwood is pretty distinct. It's flat top is the result of glacial action in the region over 10,000 years ago. This is the same action that gouged out Powell Lake and the many inlets along the coast. At the turn of the 20th Century, it was logged. The second growth trees have grown to substantial size, but you can still find evidence of the past. This old winch on the shore of the sandy spit pays tribute to the island's history. Today, it is uninhabited and is a traditional and sacred place for the Sliammon First Nation. Harwood Island is a popular destination for sea kayakers. 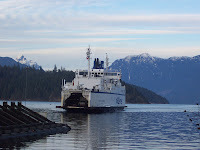 Leaving from Powell River or nearby Gibsons Beach, you can reach Harwood fairly easily on a calm day. For those with more skill and energy, you can circumnavigate the island and view the sea lion rookeries on the back side. It is also prime salmon fishing territory. 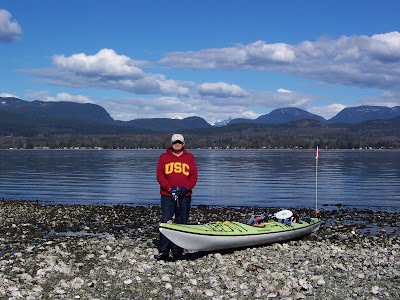 For more information about sea kayaking, I recommend Powell River Sea Kayak, Alpha Adventures and Alpha Dive Services. To learn more about kayaking in our area, I recommend reading Sea Kayak Desolation Sound and the Sunshine Coast by Heather Harbord. And of course, there's Wayne's Up the Strait available online at www.PowellRiverBooks.com. Potatoes are an important crop in my vegetable garden. I plant Norland red potatoes because they are great for boiling, baking and frying. This year I wanted to save space, so I grew them in a barrel. Here's the video that got me started. I used a 55-gallon plastic barrel cut in half with slits in the bottom for drainage. I started with six inches of soil, placed my seed potatoes on top and covered them with an additional inch of soil. Once they sprouted, I covered the leaves completely with more potting soil. I wasn't sure it would work, but they sprouted again, even more vigourously. I had enough room to cover them one more time. Then I left them alone until flowering was complete and the leaves died. When is One Carrot a Whole Bunch? Each year I've planted carrots in my floating garden. They grow well and last into late fall for harvesting. They've even survived under a light snow. I plant my garden in late March or early April, after the threat of frost has passed. I start by augmenting my soil with mulch, peat moss and steer manure. I like to wait a few weeks between the soil work and seed planting, but this year the weather didn't cooperate. I only had one week of resting before the seeds went in the ground. The Strait of Georgia runs north from the Canadian border between the southern tip of Vancouver Island and the mainland. It flows past the beautiful Gulf Islands all the way north to the Discovery Islands near Campbell River. This section of water is a busy marine highway. Tugs pull heavy loads of containers, sawdust and logs. They travel day and night in all kinds (and I mean ALL kinds) of weather. From my condo in Powell River, I can watch all of the pleasure boats, tugs, cruise ships and fishing boats passing north and south. It's like a parade, day and night. Logging has a long history in British Columbia. I found an interesting blog called Tim-Ber with an informative post on the history of log booming. Do you like historical pictures? Here is a link to the Library and Archives Canada with lots of old logging pictures.